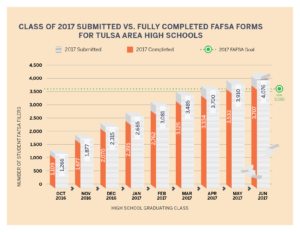 Welcome to Brink Tulsa’s FAFSA initiative! We’ve created a toolkit to help dedicated, high school college counselors assist their students on their quest to fill out the FAFSA. We’ve created a timeline that streamlines the process, providing every resource, flyer, announcement, and video needed to have strong completion rates in your school. 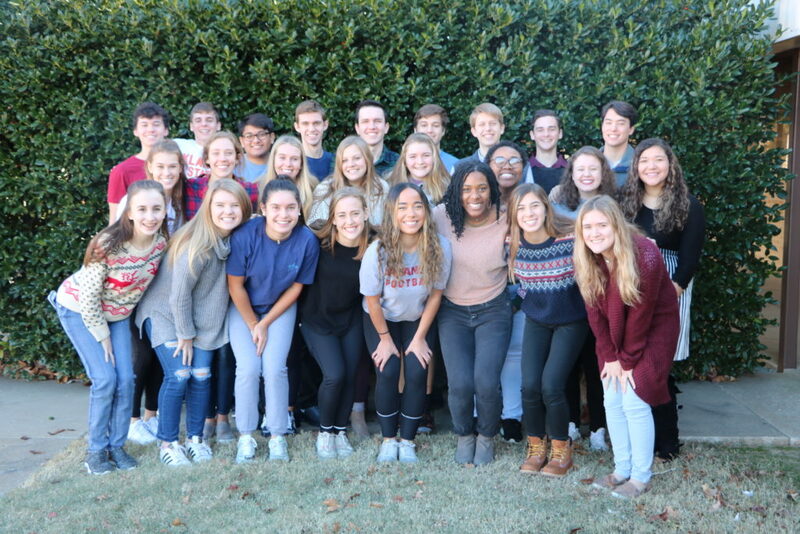 Youth Philanthropy Initiative Cohort 9 has spent three years developing a sustainable, philanthropic initiative. Our goal is to create a FAFSA-focused ecosystem in schools to promote college-forward thinking. We aim to do this by equipping schools with the tools to increase FAFSA completion. Each one of us was selected for a project due to our passion for philanthropy and drive to enhance the quality of our community. As high school students, we felt a personal connection to the post-secondary enrollment process. Through research we found that finances were a lead cause of the lack of enrollment and saw that assistance was available through FAFSA. Brink is the connection needed for success. Brink has devised a step by step plan for any school system to implement. The plan includes how to create a steering committee, how to host successful FAFSA events, how to fill out the form, and how to spread awareness about the FAFSA. Your step-by-step guide to a successful FAFSA Season! August: Get Ready for FAFSA Season! As the school year begins, it is important to educate students on the opportunities awaiting them after high school. If students are unaware of federal student aid, they may not even be interesting in continuing their schooling. We’ve created an interactive, step-by-step calendar for you to use for promoting FAFSA completion in your school. Decorate your hallways! Click here for great information to remind students to apply for aid. Pack your offices with information! Download these resources to help answer complicated questions. Advertisement is the key to success. FAFSA season is approaching, keep up the advertising! FAFSA events are a great way to directly help your students. The federal student aid form is intimidating for many students, but events are a great way to assist families in process of applying. We suggest planning your first FAFSA event now, so that when the form opens, you can get the ball rolling. Keeping scrolling through our calendar for helpful information on how to be successful in assisting students. For help planning your FAFSA event, visit this website. September: Beginning of FAFSA Season! It’s the most wonderful time of the (financial aid) year! Show your seniors these FAFSA videos! We suggest sending them out over Remind 101, emailing them to parents, OR have them ready to give to students per request. View the English-version videos here. View the Spanish-version video here. Prepare your students for the opening of the FAFSA application. Have we mentioned advertising? It’s so valuable! Seniors! Need free money for college? FAFSA is your passport to receiving help to get to college. If you have any questions, your college counselor has answers. The application opens October 1 and money runs out fast, so get off your FAFSA. Have you heard of the FAFSA? It’s your chance to get free money for college! Anyone who wants financial aid for their education beyond high school will need to fill out this form. It’s used to determine the dollar amount you or your family will be expected to contribute towards college. So, get ready to fill it out when the FAFSA is released on October 1st! Don’t be afraid to send the same message twice! Reminders are valuable and if spaced out over a couple of weeks, repetitive information is better remembered. October Advertising: FAFSA Filing is OPEN! Are your students informed that the FAFSA form opens for submission on October 1? With the FAFSA, the early bird gets the worm. Encourage them to fill it out as soon as possible. The FAFSA is the opportunity to receive free money for college! Don’t forget to fill it out! This form for your graduating class is available as of October 1st. You could save thousands of dollars through the FAFSA. Hey students, get off your FAFSA! Take the first step by creating your FSA ID. Next, get your social security number, federal income tax return, and records of investments of untaxed income (if applicable). Plus, you’ll need any applicable disability information and a list of up to 10 schools that you want to receive the results of your FAFSA. Are you wondering how to fill out your FSA ID? 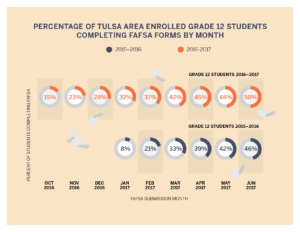 Here’s a helpful link: https://studentaid.ed.gov/sa/fafsa/filling-out/fsaid If you have further questions, check out the FAQ and Interactive Question Board on Impact Tulsa’s website at https://www.impacttulsa.org/fafsa/. Have you checked your FAFSA progress? Make sure to be keeping close tabs on your school’s success this year. The best way to improve is to keep track of where you are now. Click to find your school’s FAFSA information. Hey Seniors, don’t forget to fill out the FAFSA! It’s the best way to get free money for college! If you have created your FSA I.D., you’re ready to fill out your FAFSA! Get free money for college! 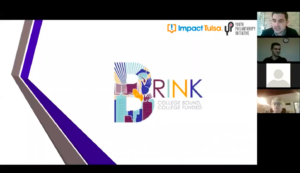 If you have questions, check out the FAQ and Interactive Question Board on Impact Tulsa’s website at https://www.impacttulsa.org/fafsa/. For additional information on how to fill out the FAFSA visit this YouTube playlist: https://www.youtube.com/playlist?list=PL23B9A23CD8DD82DD. You have until June 30, 2018! Get off your FAFSA! 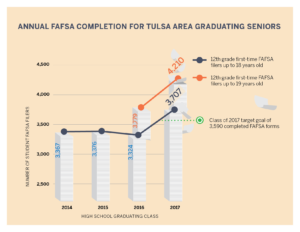 If you have further questions, check out the FAQ and Interactive Question Board on Impact Tulsa’s website at https://www.impacttulsa.org/fafsa/. Don’t forget to fill out the FAFSA! It’s the best way to get money for college! Early November: Early Action Deadline Approaches! The early action deadline is approaching. Get your money before it runs out! FAFSA has been open for a month, so the likelihood of money being on the table for applicants starts to decrease. Therefore, to increase your chances of getting money from completing the FAFSA, you must complete it as soon as possible. The FAFSA works on a first come, first serve basis. Also, some colleges have their own deadline for the completion of the FAFSA since they can look at the form to determine how much money they can give to you out of their own funds. Remind 101: Today is the early action deadline for your FAFSA. Remember, the early bird gets the worm! Fill it out before time runs out! Announcement: Seniors, take advantage of all that your future has to offer! Today is the early action deadline! As the school year continues, it is incredibly important to continue to help your students complete the FAFSA. Here are some ideas to finish the FAFSA season strong! Allow your students to fill out FSA ID’s during school time. This increases the likelihood they will finish the process. Host several FAFSA events throughout the entirety of FAFSA season. Make FAFSA a challenge. Encourage your students by posting the school’s progress in the hallway. Help yourself by using the many available resources we have provided, like pamphlets and posters . Join a FAFSA community. Ask other counselors in your city what is effective for them in FAFSA season. FAFSA centered communities are most effective. Never stop sending reminders out. Students will catch on! 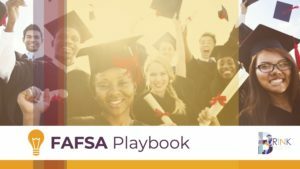 We’ve created a FAFSA Playbook for your students benefit. Please share!